Toss the pumpkin slices in the olive oil and season well. Toast the pumpkin seeds in a pan over a medium heat for 5 minutes until they start to pop. Allow to cool and place in a blender with the rest of the dressing ingredients. Blitz together, adding a little water until the mixture is easy to pour. Season well. Cook the pumpkin slices by grilling or roasting. 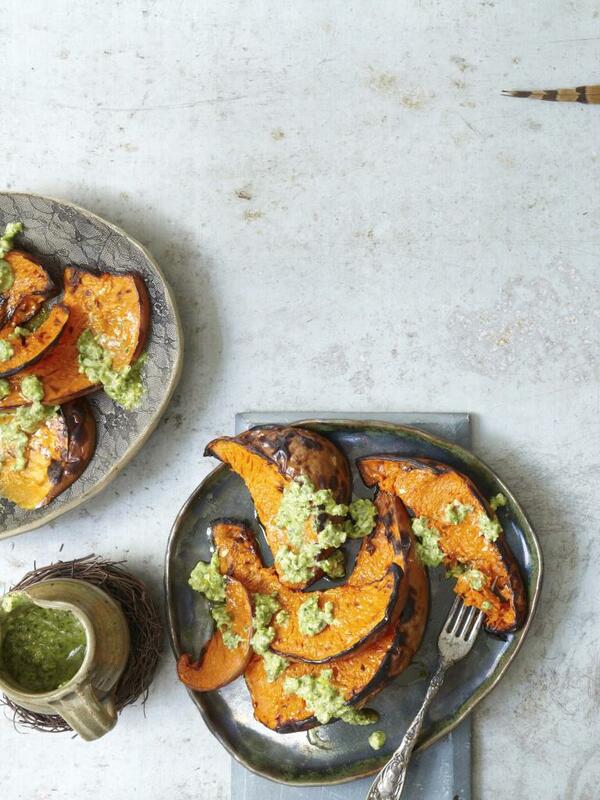 A contact grill is useful or the pumpkin can be cooked on a griddle plate for a few minutes either side until tender. If roasting, cook in a medium oven for about 30 minutes. To serve, arrange the pumpkin slices and drizzle with the dressing. Optional – sprinkle with cooked corn and goat’s cheese.